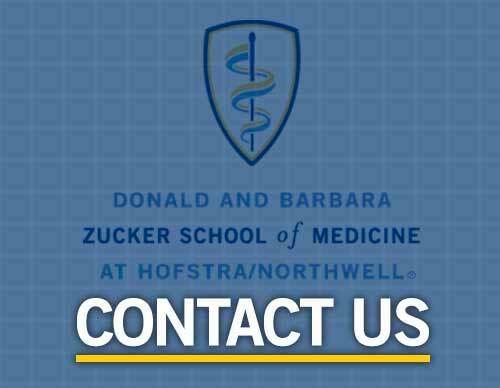 The Donald and Barbara Zucker School of Medicine at Hofstra/Northwell is the latest addition to the home of medical professional education. The original building also referred to as the East building (former home of the New York Jets summer training facility) was expanded to add a West building and the entire facility now totals approximately 113,000 square feet, including a structure (anatomy) lab and an ultramodern theater. The East building offers 16 flexible learning areas, a 108-seat theater called the Medical Education Theater (MET), a health sciences library, a student lounge that was formerly our original structural anatomy lab, as well as a full service Servery. The West building expansion has allowed more room to house a growing population of faculty, staff, and students. Early in the Zucker School of Medicine renovation process, the team decided to design a building that could be considered for LEED Silver certification; which we have achieved. The new environmentally conscious Zucker School of Medicine LEED Silver building framework and layout reflects "Main Street," an open, contemporary yet inviting space and seamless design that is punctuated by small group rooms, a multipurpose area, dining and lounge retreats both in- and outdoors to inspire socialization, collaboration and community. The building was designed to meet the highest standards for LEED Silver Rating (green building leadership) and successfully achieved this goal. The west building expansion created a single grand entryway (two-story entrance) for both buildings that features a welcoming 4,800 square foot atrium, a theater with seating for 240 people, in addition to an additional large group area that can host over 100 people. This area can also be separated into three individual classrooms, each accommodating 35 people and added twelve small group-study rooms, each accommodating eight to ten students. The west building expansion also created a larger structure lab facility with room for more than 125 individuals that features the very latest in medical-surgical equipment, lighting and technology. The former structure lab facility, in the East building, was renovated and repurposed into an inviting student lounge, complete with dining and relaxed-seating areas, work stations, and entertainment. In addition to instruction areas, the west building expansion added approximately 44 faculty and administrative offices, including rooms for clinical skills practice, work space for approximately 15 support staff and a Dean's office suite offering a large formal conference room to accommodate 25 individuals. Outside, the west expansion features an alternate roadway to access the medical school complex, including parking for more than 100 additional vehicles. Other peripheral highlights include new exterior landscaping, outdoor seating and tables, walkway lighting, and half-court basketball. Lecture Capture System—allowing sessions to be recorded for playback over the network; Push-to-Talk—featuring automatic video capture of students speaking from the audience. The AV system is fed with dual point/tilt/zoom (PTZ) cameras, local Blu-Ray and DVD/VCR players, as well as rack-mounted PCs for presentation content. Audio is supported via ceiling-mounted and wall-recessed loudspeakers, along with a wireless assistive listening device for ADA compliance. The AV system is controlled via multiple wall-mounted and wireless touch panels that allow for control of all AV components and features, including the lighting system. The 7,300 square foot structure laboratory offers maximum capacity, allowing room for more than 125 individuals. Approximately 7,000 square feet of the structure lab is composed of a large open dissection teaching space and work area. *Locker areas for men and women. While working in the lab, faculty and students experience new built-in telecommunication technology/computers, large monitors, and state-of-the-art surgical lighting. club rooms, one student council office, a storage pantry space as well as music room.